Looking for a fresh activity to do with your kid? Try some AcroYoga! 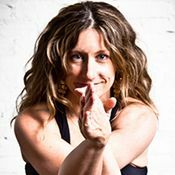 Enjoy this lighthearted 13-minute practice that features airplane pose, folded leaf, fish, side bow, and two scoops.